(EN) When (re)building a city district from scratch, the participation of its future inhabitants is key. 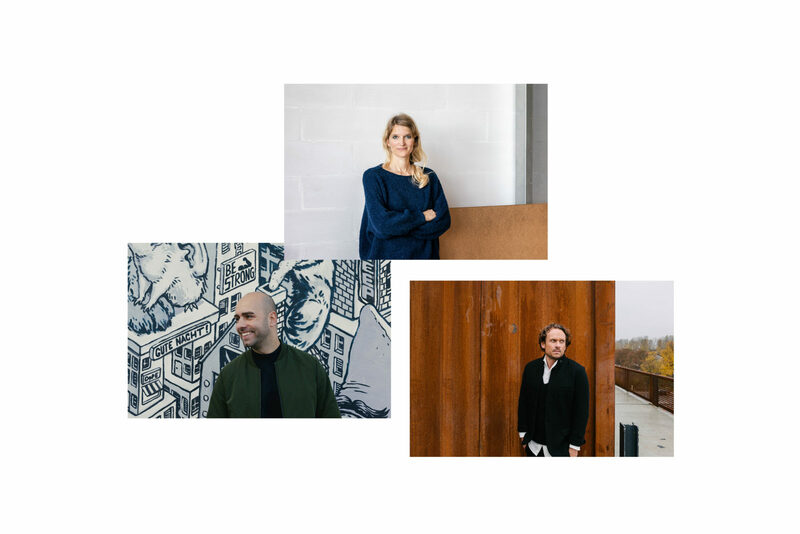 Caroline Nagel, Benjamin Scheerbarth, and Oke Hauser share insights into their people-centered projects in Cologne, Berlin, and Shanghai. (EN) In terms of ingenious living concepts, Copenhagen is often a city architects look to for sustainable and ecologically-minded urban planning. The Danish capital has set itself the goal of becoming the world’s first CO2-neutral capital by the year 2025. For Caroline Nagel, who hails from Mönchengladbach and studied architecture in Berlin, the city became the center of her life and work twelve years ago. Today, she’s employed at COBE Architects, where she is part of the management team and one of six project directors. She is currently working with her team on the urban development of Cologne’s Deutzer Hafen district. « We want to transform the former industrial harbor into a lively and sustainable neighborhood, » says Nagel. The plan for this converted industrial port is a lively urban neighborhood with living space for 5,000 residents and working space for an additional 4,500 people. A new bicycle bridge over the Rhine connects the district with central Cologne. The innovative project utilizes new designs, converting abandoned industrial facilities, like an old mill, while still preserving the historical character of the original structure. Water also plays a big role in this community: not only is the building complex on the riverfront, a huge waterfall and a public swimming pool are also planned. “We wanted to continue the diversity of the old harbor area and transform it into a dynamic neighborhood,” says Nagel. She points out that the public spaces are playing an important role in developing the area, where the neighborhood, the people working and living there, and the visitors, can meet in parks, walk along the promenades and hang out in the urban squares. Having a focus on public infrastructure, cars should not dominate the new city district. Structures with flexible elements are also important—such as a parking garage with space for potential alternative uses—and lively street life with a night shop culture typical of the city of Cologne. Nagel is a proponent of cultivating personalized relationships with public spaces, otherwise referred to as « Kantzonen, » in which the residents have the opportunity to participate in the design of public spaces such as the patches of land between buildings and streets. (EN) Caroline Nagel, Benjamin Scheerbarth and Oke Hauser will speak at The Sooner Now Cologne on November 20, 2018. (EN) Caroline and her team at the COBE offices in Copenhagen’s Nordhavn district, currently undergoing a transition from an industrial area to a modern residential quarter. (EN) The redesign of the Deutzer Hafen puts emphasis on architectural and social diversity. After discussing the future of the industrial district for many years, the city finally commissioned COBE Architects to carry out the development. In the years to come a new quarter is being established, that conserves the industrial heritage while meeting the demands of its future inhabitants. (EN) For Nagel, this is a prime example of how large-scale projects in metropolitan areas can be implemented in an ideal way. For one thing, converting old industrial structures is a forward thinking and sustainable way of building. Alternatively, when city districts are built from scratch, new opportunities present themselves. This is because, while transportation infrastructure is already established in existing city spaces, planning for an urban district can open up alternative solutions to mobility. Local residents should ideally be involved throughout the development process. During the initial planning phase of the Deutzer Hafen project, for example, various forms of dialogue with the community as well as public presentations were conducted early on: « That helped a great deal. Only by inviting the citizens and authorities themselves to discuss the city that they want to live in, can we hope to create a better, healthier, more social and even more attractive everyday living in our cities,” explains Nagel. (EN) A design for the former industrial harbor in Deutz, Cologne’s district East of the Rhine. It’s main attraction: the central water basin, serving as a public swimming pool. (EN) Benjamin Scheerbarth also considers locals to be the real experts on their neighborhoods, and believes their participation should be cultivated, not just one of the steps in the planning process. Between 2016 and 2018, Scheerbarth was the project manager of the student housing and start-up center Eckwerk, which was to be erected on the Holzmarkt site in Berlin, but ultimately did not come to fruition. As a model project, however, Holzmarkt at the Spree River is still alive and well. For Scheerbarth, this is a working example of a social experiment on urban practices. « For me, it reflects how highly creative agents from Berlin subcultures took a piece of the city and made the public demands their focus.” The Holzmarkt is a creative village born out of the spirit of Berlin’s nightlife. “It takes creativity and the improvisational character of interim use and converts those into methods for sustainable development, » he adds. The legendary Bar 25, which closed in 2010, is still the secret heart of the project, because music plays a key role here. It is a place where music is produced, people manage festivals and record labels, book events, run a concert hall, and recording studios. Next to a nursery, artisan businesses such as a bakery, a coffee roastery, and a brewery have also settled here around a market square. In 2019, there are plans for a new guest house to be constructed on site. For Scheerbarth, the creative village is a passion project that, in his opinion, no city planner or architect could ever have conceived of. The Holzmarkt is proof of one of his central convictions: a city must remain affordable for people who want to experiment. He still considers the symbiosis of living and working, as was intended by Eckwerk, to be relevant, but he also observes other impulses emerging in the younger generation. « Generation Z is more critical about the fusion of private and work life. » Still, in Scheerbarth’s eyes, creative work doesn’t follow a strict schedule and people will become even more nomadic in the future—a place like Holzmarkt welcomes this lifestyle. (EN) Benjamin Scheerbarth at Holzmarkt in Berlin. (EN) Under the slogan “Spree access for everyone” the Holzmarkt, Berlin’s public “creative village”, opened in 2017—a response to the prevalent building activities along the Spree’s waterfront. The cooperative behind it was formed by members of the former techno club Bar 25 as well as other interim use projects residing on the Holzmarkt compound. Part of their plan was the Eckwerk, a wooden high rise complex designed by Kleihues + Kleihues and Graft providing affordable living and working space. The project was cancelled last year, after years of ongoing debate. (EN) The MINI LIVING co-living building in Shanghai, which will open in 2019, is proof that it is indeed possible to bring an imagined project to life, even in the center of a megacity. Since 2016, MINI LIVING has been creating innovative ideas for life in urban areas worldwide. Oke Hauser represents the initiative, acting as both Creative Leader and Project Manager. « We live in an age that is characterized by great international mobility, » says Hauser. He himself is a prime example. After working in Switzerland, Berlin, and New York, he’s living at least for the moment in Munich, but actually says his main residence is his suitcase. The location in China will not be a one off; there are already plans in place for other cities. On a 8,000 square-meter site, a building will be erected that combines living and working space under one roof, as well as common spaces for leisure activities, culture, and social encounters. « Many people commute between cities and even countries, but there is no adequate housing supply that allows for short leases and still connects the temporary residents with the local culture, » adds Hauser. (EN) As Creative Lead at MINI LIVING Oke Hauser is occupied with new forms of co-living. (EN) The project in Shanghai is intended to fill those needs, providing very flexible and short term rental offers for as little time as one month. The building merges the different elements of a city, there are places to work, to exhibit. “We wanted a building that opens itself to the outside, it was meant to get in contact with the city, not through memberships, but an open door philosophy,” says Hauser. This concept could present an alternative to anonymous residential living. It is often the case that you only meet and interact with your neighbors by chance—in the corridor, in the laundry room, or in the elevator. According to Hauser, however, architecture must cultivate more meeting places, and this is the aim of his co-living building. (EN) In 2019, MINI LIVING will open its first co-living house in Shanghai. An old industrial complex will be turned into a multi-layered building that combines living and working space under one roof, as well as common spaces for leisure activities, culture, and social encounters. (EN) On November 20, 2018 Caroline Nagel, Benjamin Scheerbarth, and Oke Hauser are scheduled to appear at The Sooner Now in Cologne. With short lectures and a joint panel discussion, they will present their projects and discuss innovative urban development and future living concepts together with Miriam Pflüger from the Montag Stiftung Urbane Räume. The Sooner Now is a joint initiative of FvF and MINI Germany, which has taken on the question of how we want to inhabit our cities in the future. Over the course of the year, roundtable discussions and lectures took place in selected major German cities. All editions can be found here. This year, the long-term cooperation is also supported by the design magazine IDEAT.